Photovoltaics (PV) is a method of generating electricity by converting solar radiation (sunlight) into direct current electricity by using semiconductors that exhibit the photovoltaic effect. These semiconductors are called solar panels and are composed of a group of solar cells containing a photovoltaic material. 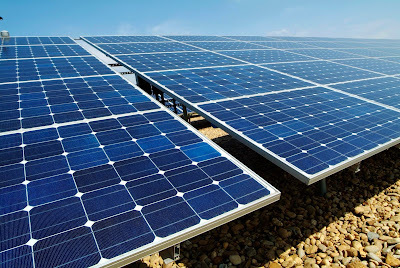 Materials presently used for photovoltaics include monocrystalline silicon, polycrystalline silicon, amorphous silicon, cadmium telluride, and copper indium gallium selenide/sulfide. Due to the growing demand for renewable energy sources, the manufacturing of solar cells and photovoltaic arrays has advanced considerably in recent years. Photovoltaic is derived from the word "photo" meaning light and "voltaic" which refers to the production of electrical power. Solar based electricity is slowly entering the mainstream market evidenced by the number of solar panels sprouting up on the rooftops of many houses. With the advent of cheaper materials and more efficient technology, in ten years or less, solar energy can be up to par with traditional coal generated electricity. As proof, scientists have recently discovered a way to economize the production of these solar panels and increase the power output. Visitors to Statuary Hall in the U.S. Capitol Building may have experienced a curious acoustic feature that allows a person to whisper softly at one side of the cavernous, half-domed room and for another on the other side to hear every syllable. Sound is whisked around the semi-circular perimeter of the room almost without flaw. The phenomenon is known as a whispering gallery. Engineers have studied this phenomenon and utilized this peculiar effect to recreate it using light instead of sound. The results, say the engineers, could dramatically reduce materials usage and processing cost. In a paper published in Nature Communications, a team of engineers at Stanford describes how it has created tiny hollow spheres of photovoltaic nanocrystalline-silicon and harnessed physics to do for light what circular rooms do for sound. "Nanocrystalline-silicon is a great photovoltaic material. It has a high electrical efficiency and is durable in the harsh sun," said Shanhui Fan, a professor of electrical engineering at Stanford and co-author of the paper. "Both have been challenges for other types of thin solar films." The downfall of nanocrystalline-silicon, however, has been its relative poor absorption of light, which requires thick layering that takes a long time to manufacture. The engineers call their spheres nanoshells. Producing the shells takes a bit of engineering magic. The researchers first create tiny balls of silica — the same stuff glass is made of — and coat them with a layer of silicon. They then etch away the glass center using hydrofluoric acid that does not affect the silicon, leaving behind the all-important light-sensitive shell. These shells form optical whispering galleries that capture and recirculate the light. "The light gets trapped inside the nanoshells," said Yi Cui, associate professor of materials science engineering at Stanford and a senior author of the paper. "It circulates round and round rather than passing through and this is very desirable for solar applications." The researchers estimate that light circulates around the circumference of the shells a few times during which energy from the light gets absorbed gradually by the silicon. The longer they can keep the light in the material, the better the absorption will be. "This is a new approach to broadband light absorption. The use of whispering-gallery resonant modes inside nanoshells is very exciting," said Yan Yao, a post-doctoral researcher in the Cui Lab and a co-lead author of the paper. "It not only can lead to better solar cells, but it can be applied in other areas where efficient light absorption is important, such as solar fuels and photodetectors." 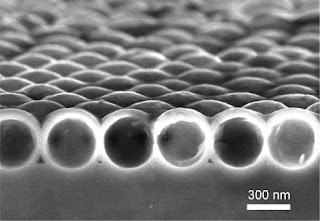 In measuring light absorption in a single layer of nanoshells, the team showed significantly more absorption over a broader spectrum of light than a flat layer of the silicon deposited side-by-side with the nanoshells. "The nanometer spherical shells really hit a sweet spot and maximize the absorption efficiency of the film. The shells both allow light to enter the film easily and they trap it so as to enhance the absorption in a way larger-scale counterparts cannot. That is the power of nanotechnology," said Jie Yao, a post-doctoral researcher in Cui's lab and co-lead author of the paper. Further, by depositing two or even three layers of nanoshells atop one another, the team teased the absorption higher still. With a three-layer structure, they were able to achieve total absorption of 75% of light in certain important ranges of the solar spectrum. Having demonstrated improved absorption, the engineers went on to show how their clever structure will pay dividends beyond the mere trapping of light. First, nanoshells can be made quickly. "A micron-thick flat film of solid nanocrystalline-silicon can take a few hours to deposit, while nanoshells achieving similar light absorption take just minutes," said Yan. The nanoshell structure likewise uses substantially less material, one-twentieth that of solid nanocrystalline-silicon. "A twentieth of the material, of course, costs one-twentieth and weighs one-twentieth what a solid layer does," said Jie. "This might allow us to cost effectively produce better-performing solar cells of rare or expensive materials." "The solar film in our paper is made of relatively abundant silicon, but down the road, the reduction in materials afforded by nanoshells could prove important to scaling up the manufacturing of many types of thin film cells, such as those which use rarer materials like tellurium and indium" said Vijay Narasimhan, a doctoral candidate in the Cui Lab and co-author of the paper. Finally, the nanoshells are relatively indifferent to the angle of incoming light and the layers are thin enough that they can bend and twist without damage. These factors might open up an array of new applications in situations where achieving optimal incoming angle of the sun light is not always possible. Imagine solar sails on the high seas or photovoltaic clothing for mountain climbing. "This new structure is just the beginning and demonstrates some of exciting potentials for using advanced nanophotonic structures to improve solar cell efficiency," said Shanhui Fan.